Check out this great new book by Eleanor Burns. We're making kits from the book as fast as we can. Love these quilt. Hooray Eleanor. 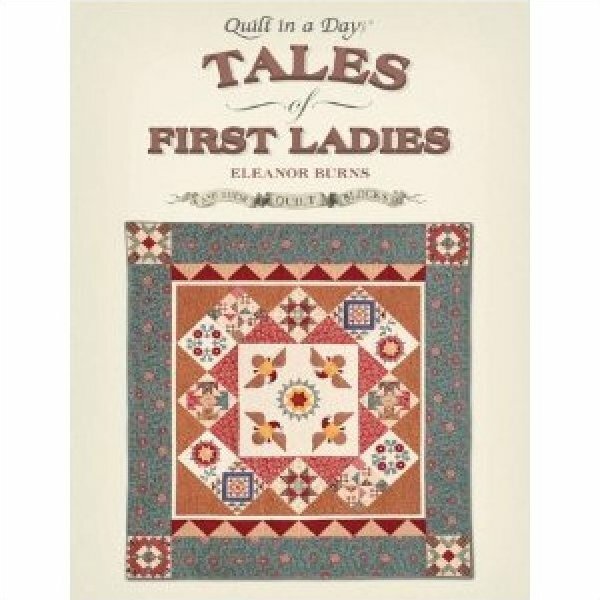 Delve into history with Eleanor as she leads you through eight traditional quilt blocks that pay tribute to a selection of American First Ladies who have earned their place in our country’s history. Read interesting tidbits of information about these much admired women, facts that your history teacher never taught you! With yardage charts and instructions for both 12” and 6” blocks, you can tailor your quilt to the size you desire. The book contains 124 full color pages with instructions for pieced blocks and applique. The setting for this quilt was patterned from an antique quilt and by using Civil War Reproduction fabrics, the quilt takes on an heirloom, antique effect. Eleanor offers two options for the center block, pieced medallion and appliqued eagles to further enhance this beautiful sampler quilt. The Eagle cut out is now available as a die from Accuquilt. For a dynamic finish, Eleanor selected a Flying Geese patch border and pieced corner blocks. “Tales from First Ladies” was Eleanor’s Block Party for this year and each pattern has been tested and enjoyed by over 100 students. Videos of each month’s block parties are available for viewing on the Quilt in a Day website Media Theater at no charge.